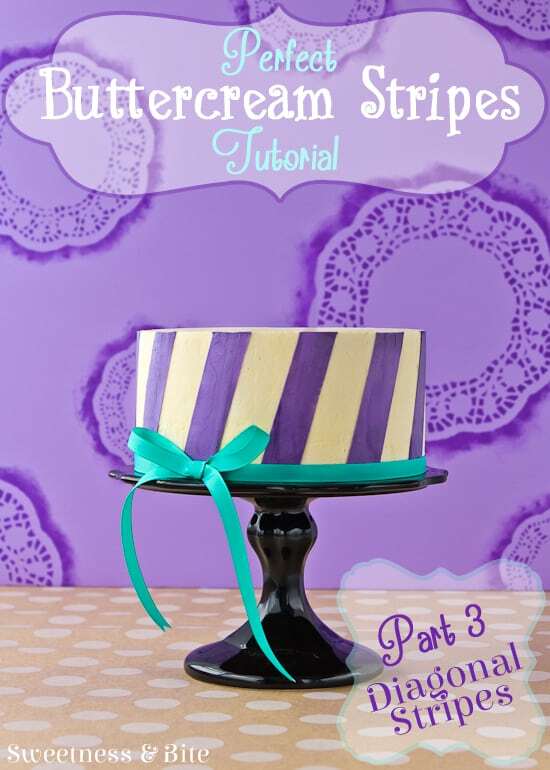 We’re up to the third and final part in my buttercream stripes tutorial! 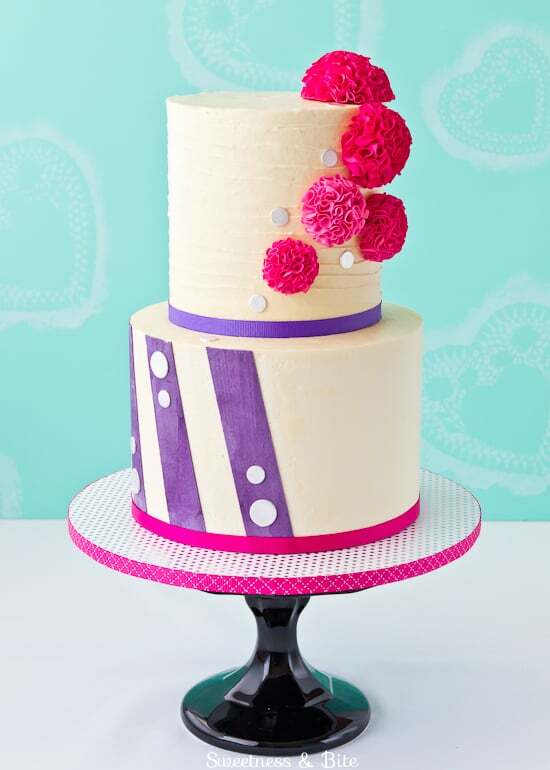 We covered the cake in smooth buttercream in Part One, and then decorated one tier with vertical stripes in Part Two. Now we’re moving on to diagonal stripes! These are a tiny bit trickier than the straight ones, only because of the angle of the paper strips and the fact they like to lift up when the scraper goes over them, especially on the bottom where there is a bit of overhang (or underhang? 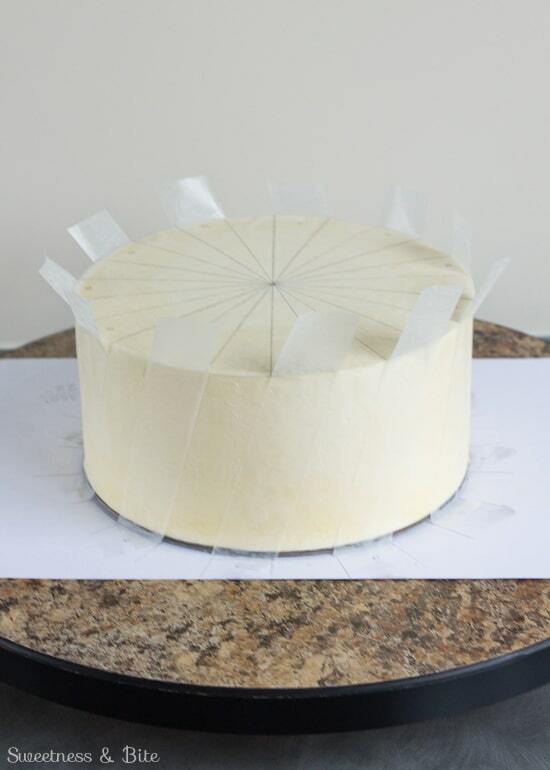 Anywhooo…) I propped it up on another cake board after adding the strips, because I didn’t want to trim them (and risk damaging the cake) or do more maths and cut each strip at an angle. Propping the cake up was the simple solution to stop the scraper catching on the ends of the strips. 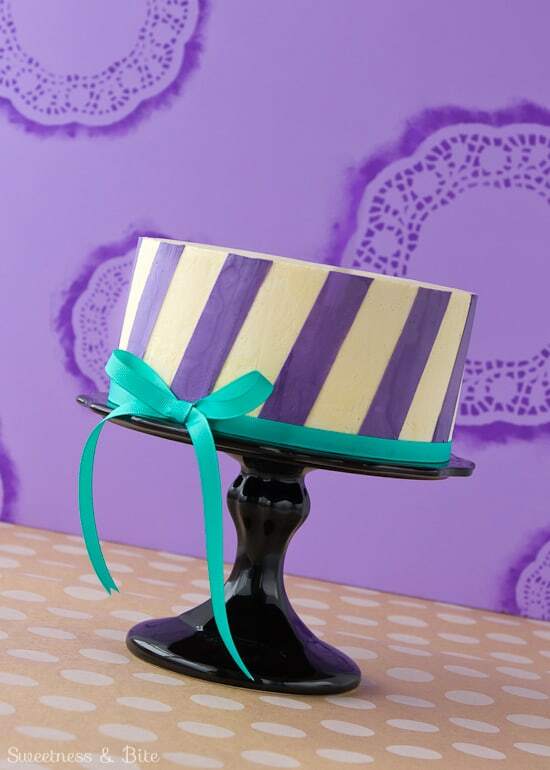 Some of the steps for this cake are the same as for the vertical stripes and I didn’t want to bore anyone by detailing it all again here, so if you haven’t read that part yet then it would be helpful to pop over and read that post first. The instructions for greasing the strips and the stages at which you’ll need to chill the cake etc. are all there. 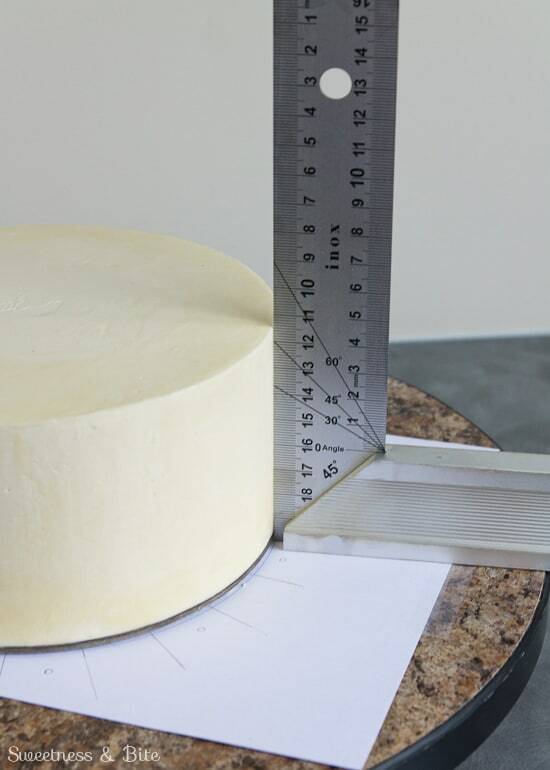 The tools you’ll need for these are the same as for the vertical stripes, but you will also need a smaller cake board (at least 5mm thick and a smaller diameter to your cake) to place under the cake. If you don’t have a smaller board then you could try using a cake tin, but you’ll have to be very careful not to knock the cake off. 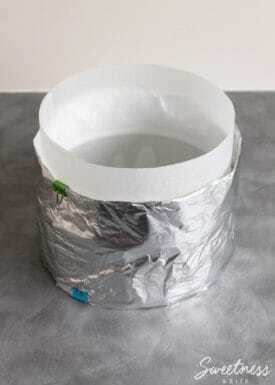 I have also used my tin of round cutters to do something similar. You will need to follow the instructions in part two to make the guides for the stripes. 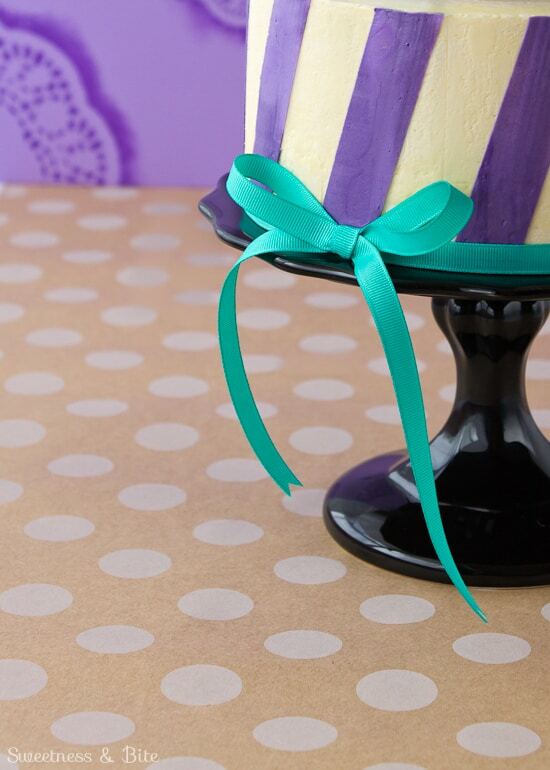 Remember to make one guide on a piece of plain paper and one on a circle of waxed paper or baking paper the same size as your cake. 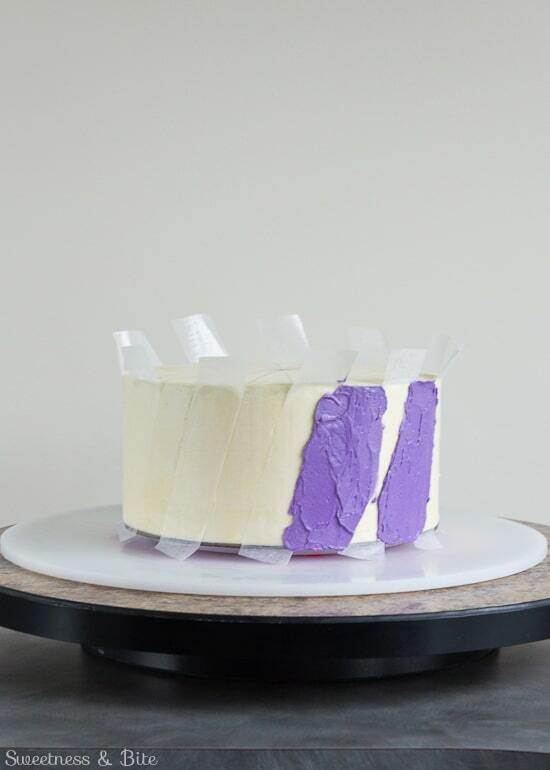 Start by attaching the bottom guide to your turntable and place your cake on top, centring the cake within the circle. 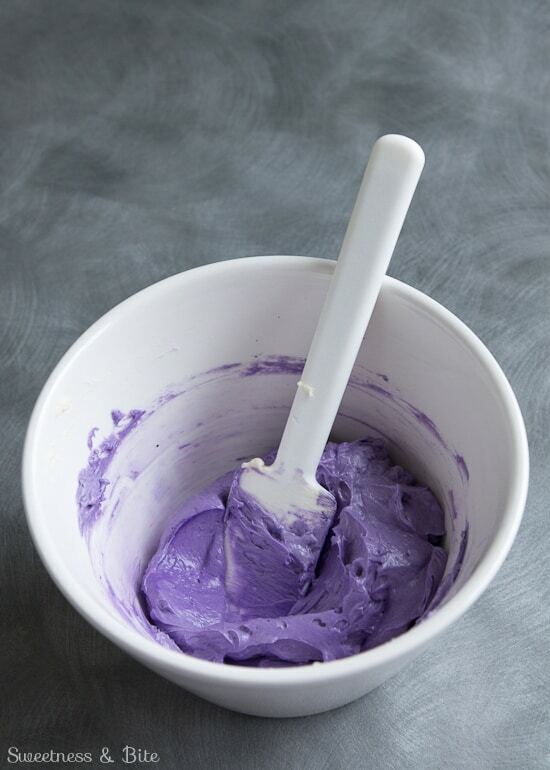 Colour your buttercream and give it a good mix to press out any air bubbles. I used Americolor regal purple and a touch of Chefmaster tropical fuchsia to get this shade. 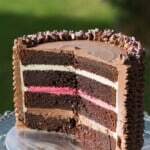 Line up a straight angle with one of the lines on your bottom guide and lightly mark the buttercream at the top. Try not to make as big a line as I did, my hand slipped and I had to fill in the dent with buttercream. Place your Crisco covered paper circle onto the top of the cake, but unlike the straight stripes, you want to line up an unmarked section on the bottom with a marked section on the top (or vice versa). See? Hand slip = bad dent. Now start adding your greased paper strips. You’ll be lining the strip up with a marked section on the top, and a marked section on the bottom, which are offset, so you’ll have your diagonal stripes. To make it easier to get the stripes in the right place without having to slide them too much (and maybe damage the buttercream) I found it easier to line up the strip at the bottom, hold it in place against the cake board with the fingertips of my left hand, while pulling it taught with the other hand and lining it up at the top before pressing it against the cake. Obviously it would be the other way around if you want your stripes to go in the opposite direction. Pop the whole cake onto the smaller cake board to prop it up. It’s a good idea to secure it with a piece of non-slip mat. 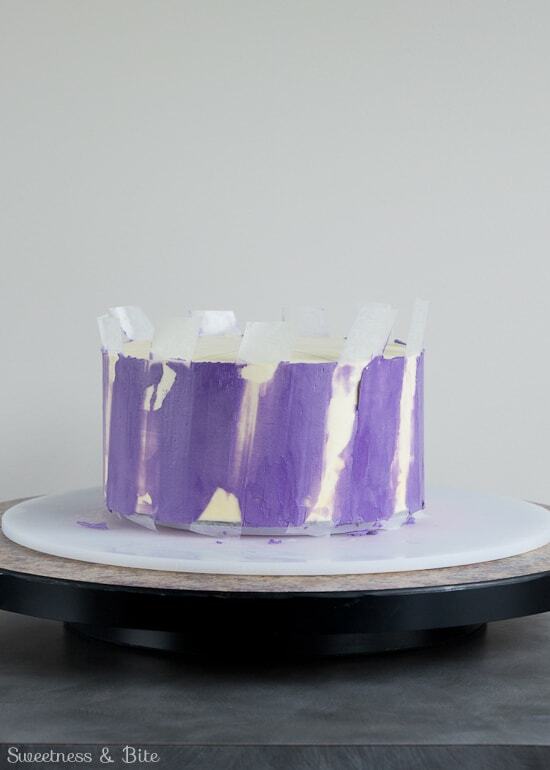 Start applying the coloured buttercream with a small offset spatula, remembering to press down the edges each strip before you spread on the buttercream. 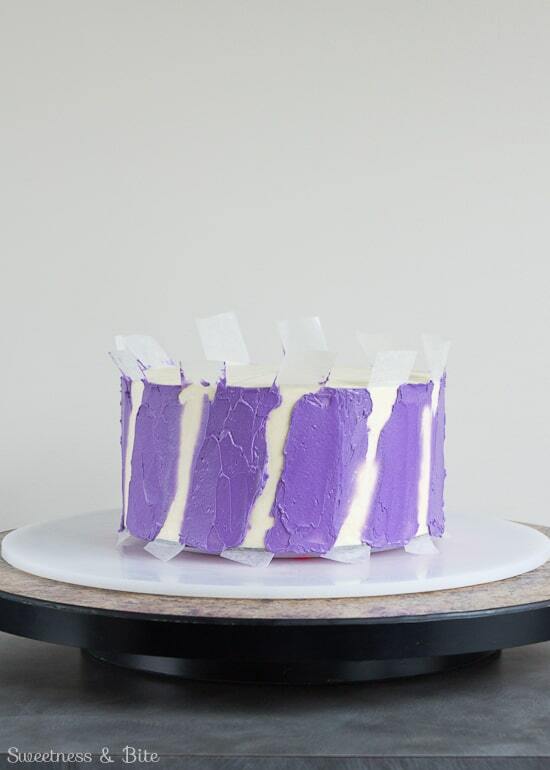 Always spread the buttercream in the direction of the stripe – try not to go side to side with the spatula or you will risk pushing buttercream under the strips. Now when it comes to scraping the stripes smooth, I found it easiest to try and hold the scraper at a similar angle to the stripes. Warm your scraper slightly and scrape from the outside of the stripe to the centre, then do the same from the other side. 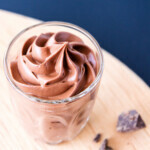 This removes most of the excess buttercream. Then you can scrape in one direction to finish smoothing the stripe. 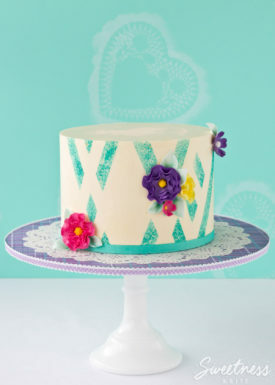 Tidy up the top edge by smearing any excess buttercream from the edge inwards onto the paper circle. 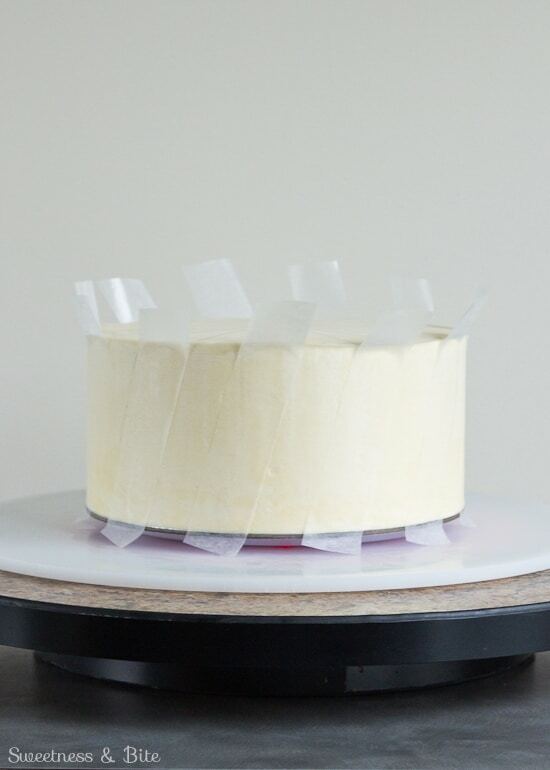 Chill the cake until the buttercream is firm, and then gently peel off the strips. 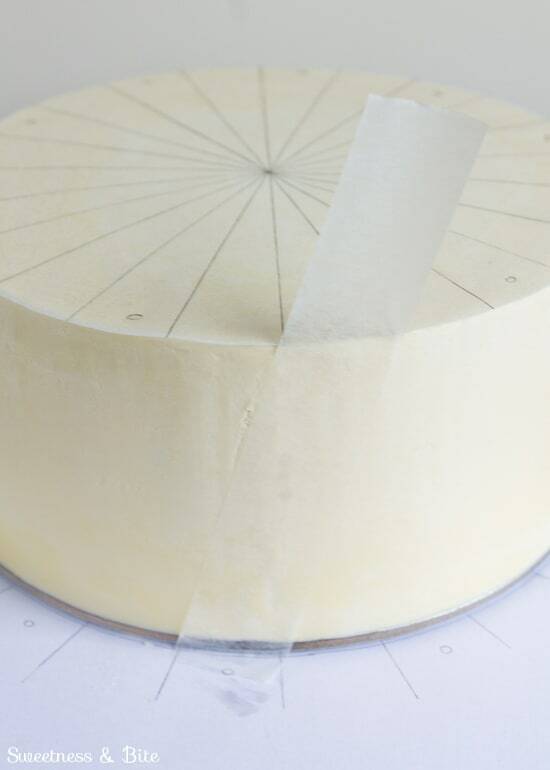 Use a spatula to carefully flick up one edge of the top circle of paper and peel that off. 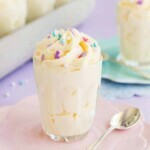 If there are any holes in the buttercream you can carefully fill them in with more buttercream, or if they’re very small you can lightly wet your finger with warm water and rub the buttercream gently to smooth it over. If you need to smooth off the top watch out that you don’t touch the spatula to the top edges of the stripes or you may smear the colour on to the top. 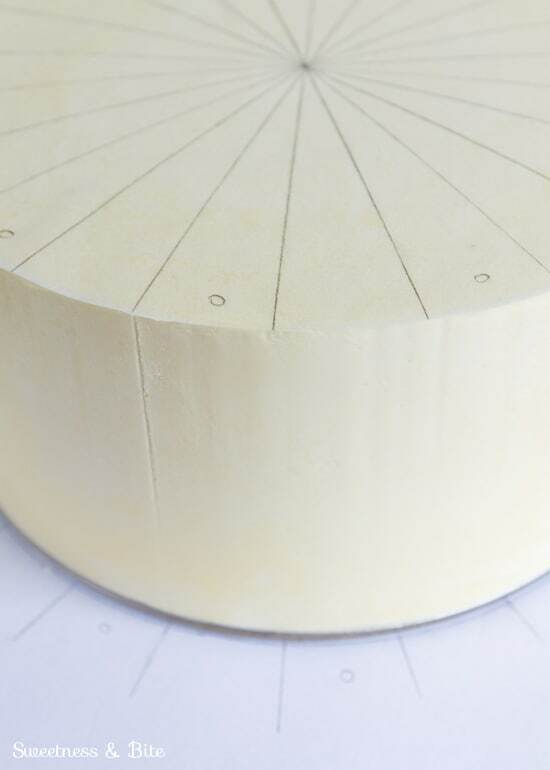 Place a metal spatula flush against the underside of the board, and scrape it gently under each stripe to remove any excess buttercream that is under the board (helps to keep your display board clean and tidy!) 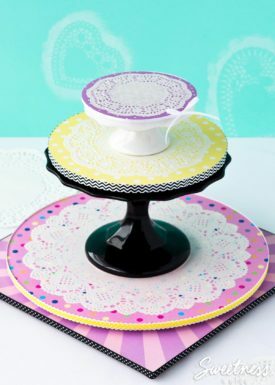 Chill the cake until firm before transferring it to a display board or cake stand, or before stacking it as part of a tiered cake. That is very clever Natalie! I don’t know if I have the patience to try this, but the wow factor could well be worth it. So beautiful! I love the combination of the two techniques in the bottom picture. Nicely done. 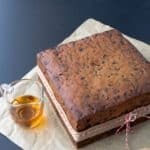 Hi Lillian, I’m afraid I haven’t made leopard print on buttercream before, but I would suggest covering the cake in buttercream as normal with pale brown buttercream, then using a spatula to apply a mid-brown buttercream in splotches, making sure you smear it on quite thinly and spread it out. 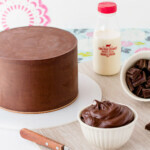 Then use either a spatula or piping bag to apply dark brown/black buttercream around the edges of the brown splotches. If you keep a picture of leopard print next to you while you’re doing it, you can use that to match the pattern. 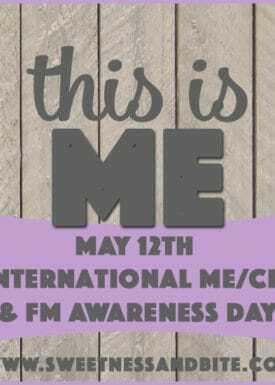 Sorry I can’t be of more help! How does this technique work for horizontal stripes? I’m out of practice decorating and I have an upcoming baby shower cake to do. 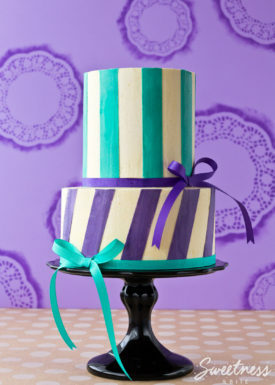 Horizontal stripes are on the invite and I’d love to match the colors/theme. Thanks for any suggestions.